Tips for Use. A good comeback if someone extols the elegance of your attire. 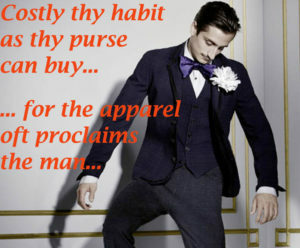 Or it can be an answer to a question on your taste in clothing, “…costly is my habit as my purse can buy, but not expressed in fancy, rich not gaudy…” followed by what other information you may wish to share. “The apparel oft proclaims the man” could be an excellent advertising slogan for any dress or fashion outfit. For the curious, ‘apparel’ is a word of French origin, ‘appareillier’, to equip, to prepare. It acquired the meaning of personal outfit or attire in the early 14th century. If you like this website why not subscribe (see last menu item to the right)? You will get automatically any new blog as well as any other information and novelty that will be forthcoming, including a system to remember hundreds of Shakespearean quotes and having fun in the process. You can also chat with me – please go to the chat-page. And I promise, no sales calls, trade leads, venomous schemes, hidden plots, Machiavellian conspiracies, commercial ploys, psychological tricks, leads exchanges, barter proposals, suggestions or offers of any kind imaginable (and unimaginable). In the Play. Polonius gives his son Laertes an extensive set of precepts to follow while in Paris. But, uncertain if he will follow them, he will also dispatch a private detective to see if Laertes follows them. This entry was posted in After Dinner Quotes, Amusing Shakespeare, Answers to Interviews, Best Shakespeare Quotes, Business Presentations, Chances Quotes, Compliments, Philosophical, Psychological & Historical Considerations, Presentation Ideas, Shakespeare in Management, Shakespeare on Fashion, Social Exchanges Shakespeare style and tagged After Dinner Quotes, best fashion quotes, best shakespeare quotes, dress for success, good advice quotes, good_answers, hamlet, polonius advice, presentation ideas, quotes about fashion, shakespeare fashion. Bookmark the permalink.